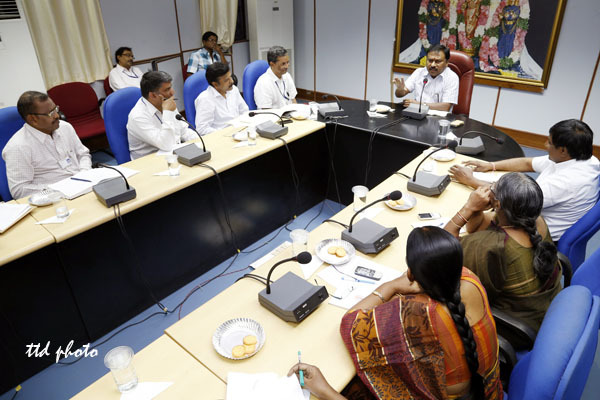 Tirupati 24 September 2014: Tirupati JEO Sri P Bhaskar on Wednesday conducted a review meeting with all HODs of TTD over the progress of e-Attendance. 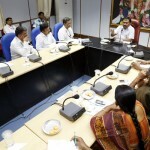 Reviewing the meeting at Conference Hall in TTD Administrative Building in Tirupati he said, the e-Attendance machines will soon be introduced in TTD administrative building, sub-temples and out side temples of TTD. “The trial run of the attendance will be taken from October 21 to November 20 before it is launched in a full-fledged manner. The HODs of the various departments will be given training after the completion of Srivari Brahmotsavams”, he added. The meeting was attended by Services Dy EO Sri Siva Reddy, GM Transport Sri Sesha Reddy and others officials.